Our youth pastor, Keith Sandison, has implemented "Fight Clubs" with the young men of our church. While these teenagers and young adults aren't actually pummeling each other physically, they are using the opportunity to aggressively challenge one another to be more attentive to their spiritual formation. Right now my son is participating in a fight club focusing on Proverbs. Keith has created a handout he uses for the fight clubs which lists seven different methods of "generic Bible study". I think the idea started with this post a few years ago, but as he often does; Keith took my thoughts and made them immensely more substantive and beneficial. What Myths Do You Believe About Small Groups? 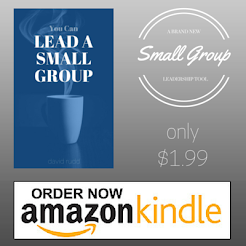 The following is excerpted from an article listing five myths about small groups. Thom Ranier wrote this excellent piece. You can read all of it by clicking here. Jesus’ small-group configuration was for about three years.The one method of a group represented by Jesus and the apostles would not be constituted as the killer app. But the group was a critical component. More was coming. The configuration and context changed after the Lord’s ascension. New clusters developed. New people were introduced into the groups. A transformational group is one that adjusts as needed to encourage growth of the group and growth in the members of the group.